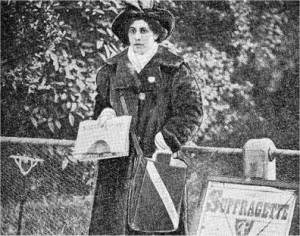 Sophia Duleep Singh; Princess, Suffragette, Revolutionary! She was one of the most important figures in the movement to secure the vote for women in Great Britain. Sophia was born into royalty; her father was a Maharajah and heir to lands that stretched the Kashmir Valley to the Khyber Pass. Queen Victoria was her godmother. At the age of 11 her father abdicated his kingdom to the British, at the same time surrendering the famous Koh-i-noor diamond to Queen Victoria. He was exiled from India at the age of fifteen and moved to England where Queen Victoria provided for his upkeep. Her father led a wayward life and the family finances suffered. In 1886, her father made an attempt to return to India with his family, having fallen out with the British government over money. He was turned back at Aden, under threat of arrest, and decided to live in Paris. Sophia’s mother decided to bring the children back to London, where she received a pension from the India Office . When she was nine, Sophia was seriously ill, having contracted typhoid. Her mother nursed her through the night but became ill herself and died the following morning. When Sophie’s father disowned her, Queen Victoria gave her a grace and favour apartment, a triple-storey building known as the Faraday House, along with an allowance of £200 a year. Apparently, thereafter, Sophia behaved as if she was “Queen of the Punjab”. Following her fathers death, alone in a Paris hotel aged just 55, Sophia did make a return trip to India, a visit which would change her life. While in India, she came face to face with reality of poverty in her homeland and saw for herself what her family had lost when it surrendered to the British government. She also discovered Indian freedom fighters who were at that time agitating for self rule and gradually turned against the British Empire. On her return she joined the Women’s Social and Political Union (WSPU) and pioneered the cause of women’s voting rights; she funded the movement and became a leader for the cause. Although primarily concerned with the rights of women in Britain Sophia also promoted similar militant activities in the colonies. Sophia raised funds for the cause by pleading for subscriptions and sold the newspaper “The Suffragate” outside her house – as sen in the photograph alongside this article. On one occasion, she tried to fall in front of the Prime Minister Herbert Henry Asquith’s car, while holding a poster which read “Give women the vote!”. On 18 November 1910, a date which became known as ‘Black Friday’, she and Emmeline Pankhurst led a 400-strong demonstration to parliament. As police and protestors clashed over 150 women were injured. Although Sophia supported and encouraged the more militant, aggressive activism of the suffragettes, she was never arrested. Publicity was really important in getting more people to join the cause and while her high profile made her a valuable publicist her regal status and patronage probably offered her some protection. That, and the fact that the authorities were probably wary of creating a martyr to the cause. Sophia held a place of honour in the suffragette movement alongside Emmeline Pankhurst. Sophia also belonged to the Women’s Tax Resistance League, whose slogan was ‘No Vote, No Tax’. Her refusal to pay tax led to her prosecution several times and some of her valuable possessions were impounded. One time a bailiff went to her house to collect an unpaid fine of 14 shillings, which she refused to pay. Her diamond ring was confiscated by the police, and auctioned a few days later, though it was bought by her friend who returned it to her! Shortly after, Emmeline Pankhurst died. Sophia was elected President of the Suffragette Fellowship in her place and in Sophie’s entry in the 1934 edition of Who’s Who, she gave her only interest as “the advancement of women”. Sophie did, howver, support the cause of Indian Independence. During World War I she worked as a nurse in a hospital in Brighton where she tended to wounded Indian soldiers, who could hardly believe that the granddaughter of Ranjit Singh was nursing them. At the end of the war she arranged for a flag-day to raise funds for Indian troops and hosted the Indian soldiers of the peace contingent at her residence in Faraday House. When World War II broke out, Sophia and her sister Catherine moved to a little village called Penn in Buckinghamshire. They offered their home to evacuees, which became home to a family of three children. Sophia died in 1948 and was cremated at Golders Green Crematorium.